I had a rare day to sew today so I thought I had better take advantage of it. The boy was at school, so there was no messing in my pins and running off with things just as I am about to use them. I decided I had better try and finished all of my half finished projects before I cut into my new-to-me stash of fabric from Freecycle. That was difficult for me to do, restraining myself as I did, but since I had three projects pinned and ready to go, I decided to clear the decks and gain a sense of accomplishment for a change. The first thing I did was make myself some more pads. They were already cut out, all I had to do was a run a zigzag stitch around them. Then I finished my shrug. 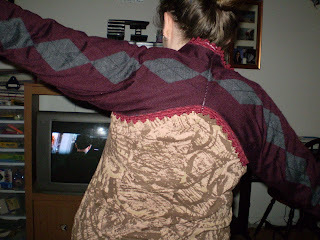 It is two sweater sleeves sewn together with some trim sewn around for prettiness. I kept talking about this finishing this one, now I am wearing it. I got the idea fr on the Wardrobe Refashion site. It's supposed to be kind of like these. It turned out quite cute if I do say so myself. 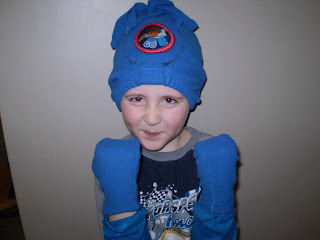 I finally made the toque and mitts I had envisioned in my head from a too-small pair of fleece Diego pants. I heart fleece. No fraying edges makes it so easy to work with as a beginner sewer. 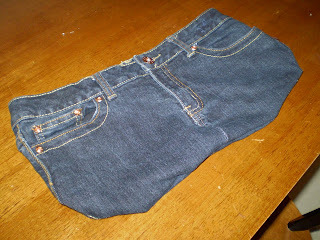 The elastic around is head is the former waistband of the pants. I turned the pants upside down and then I traced around another hat to get the shape, then cut it out. The ealstic is in fine shape so I thought why re-invent the wheel? 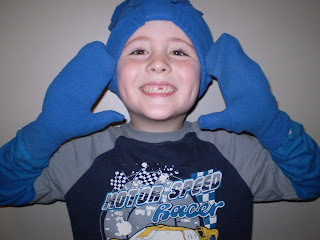 I traced my around my hand on a folded piece of paper to make a simple mitten pattern and cut out two opposing mittens, a left and a right from the remaining pant legs. The Diego patch was a last minute applique, though I would do that before sewing up the side seams if I were to do it again. Then I cut up the rest into half inch strips and made a pom pom. They fit my son perfectly and nary a scrap left of what were once too-short play pants! I like the hat because it covers his ears. He likes them because I made them especially for him. Judging by this expression, it was a pleasant surprise for him to find these on his bed after kindergarten today. Finally, I took in a pair of flared pants and took up the hem. I purchased the pants at the thrift store hoping to wear them around, they are green velvety jeans, quite neat, but the elephant ear bell bottoms and the wayyy too long hem made this impossible. I now have a great pair of pants that don't drag in the mud or flap in the breeze! Whew, I think I had better not pile up so many projects next time.